Kick off the holiday season in Downtown Goldsboro! 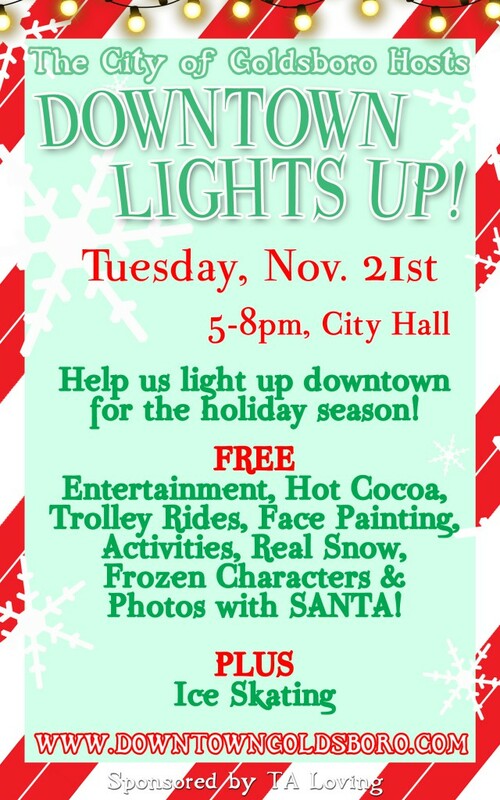 Join us on Tuesday, November 21st or a night of family fun as we flip a switch and light up Downtown Goldsboro for the holiday season! This FREE event, sponsored by TA Loving, features visits with Santa Claus, holiday characters, hot cocoa, kid’s crafts, trolley rides, holiday entertainment and more! We will meet in front of City Hall at 5 p.m. where the Mayor will help introduce guests and turn on the lights downtown. Free horse-drawn trolley rides will start at the corner of Mulberry and Center Street and will run from 5:30 p.m. to 8 p.m. While waiting, guests will enjoy a holiday movie in the John Street Parking Lot. Also, we’re excited to add ice skating to our line-up this year! From 6-8 in the John Street Parking Lot, enjoy ice skating for $5/skater. Get tickets to see the NC Symphony’s annual Holiday Pops Concert at the Paramount Theatre after the event, or plan to shop and dine at downtown’s great shops and restaurants.